I poured water into a large bowl and set it on the ground. I kneeled down and dipped my hair in the bowl to soak it. This was super awkward. I will not do that again. Next, I picked up the bowl and splashed water all over my body, then soaped up. I USED WAY TOO MUCH SOAP. It was difficult to get it all off. I had to rinse my hair multiple times, and I don’t have that much hair. Instead of kneeling down, I just held the bowl of water in my hands and rinsed my hair. 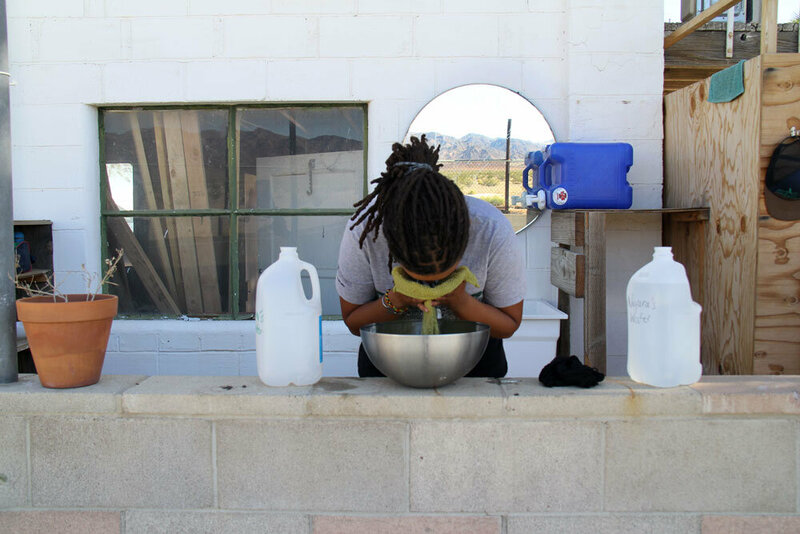 When my rinsing water was too soapy, I dumped it on me and refilled the bowl with clean water. After that, I used my hands to splash water on me to get the soap off. This was all done in a kiddie pool we found (to save the water). My showers here have very much been, wash what’s important. To give you an idea of the set up, we have our water (amount varies by person), a blow up baby pool, and two salad bowls. I started with my hair. I filled a bowl with around 3 cups of water. To dip my head into the bowl, I found it easiest to have the bowl on the floor, sit on my knees and bend over to really soak all of my hair. This made me uncomfortable for several reasons, but it works so imma get over it. This probably took most of the time. I had to really work my hair to get it untangled, wash, rinse, condition. I used the soapy water to splash on my body and get most of the dirt off. I then used a wash cloth to really soap up and rinse off. 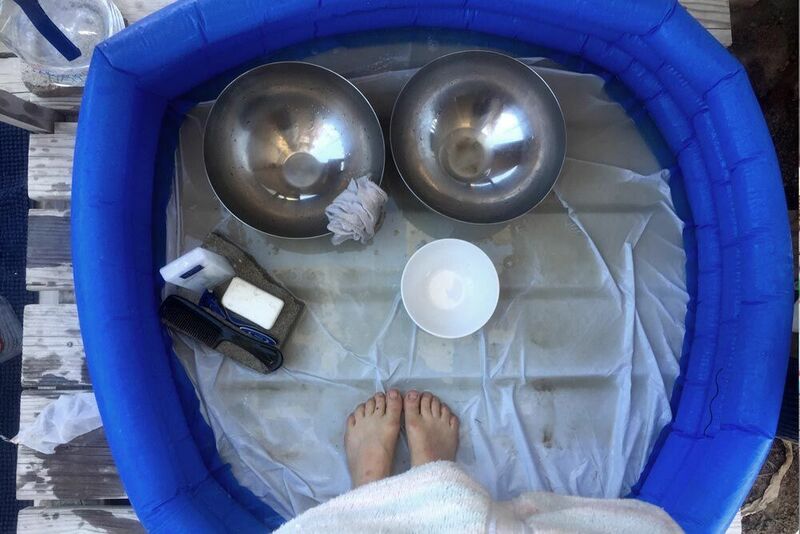 When the water in the bowl became to soapy or gross, I dumped it into the gray water bucket and refilled with fresh water, each time only adding about two cups. I was pretty successful at not getting water in the baby pool. It’s nice being out in the open desert, you dry off pretty instant and you feel so cool and refreshed. The first time I showered I used just over 3/4 of a gallon, the second time I used four cups! This was just a quick rinse though. Showering is a beast, aside from the part when I stuck my face into a bowl of water, it was extremely unsatisfying. Basically, I poured a bowl of water and used a wash cloth with soap on it to spread the water on my body. 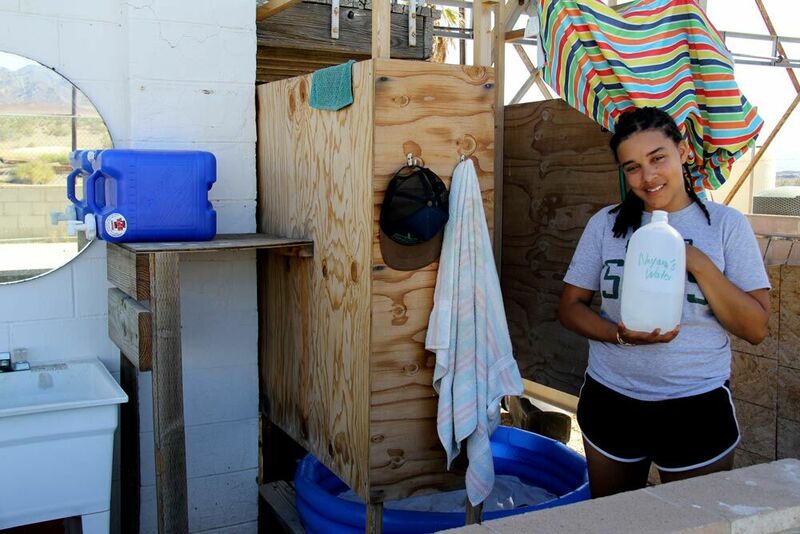 The actual shower is outside and made from wood. Though you can close the shower curtain it is better if you don’t (never mind that you have no privacy it’s not like anyone other than us are out here). The view from the shower is a beautiful scene of the desert and mountains. As you drip water on yourself using the rag and bowl of water if any of it manages to fall down, it is caught in the baby pool we stand in as we are washing. This way the grey water you produce is caught and could be used for flushing. I had planned to use my grey water to wash my clothes in afterwards but the grey water that came off my body was too dirty to wash anything in. I guess after nine days of not showering it adds up (yes I broke everyone’s record for not showering but not sure if I should be proud of that). What was surprising was I only used a quarter of a gallon for my body, and then I used another quarter of a gallon to wash my face. My face was feeling burnt from the sun, so I held it underwater, it felt so good I think that is the wettest my face has gotten since I made it to the States. Two big bowls, one small one for scooping, and a kiddie pool to catch the rinse water. I start with my hair because its long and hard to get the soap out, lean over the first bowl and pour, dunk, add shampoo, and do a preliminary rinse. Then from there its just deciding what I can use the dirtier water for (like shaving) and what needs a fresh pour (rinsing the soap off). It takes time but I like it. It feels more like ritual than just something I have to do. I had a desperate need to be clean after being dirty for so long. I know we have to save our water so we can stay here as long as possible. I ned these people to stay together here. It will be much easier to investigate them if they are all in the same place. But I still wish I had used water to wash my hair, especially because others have done so. I started out by sitting in the child’s pool in shorts and a tank top with a small pot of my personal water. I wet my legs and put a small amount of soap on. I used a rough washcloth to scrape away the grime on my legs and it felt wonderful. I splashed some water on them to rinse the soap. I did it piece by piece, conserving as much water as possible, but with special focus on my arms and feet. I might have used a bit too much soap on them since they had been exposed to dust, wind, and had multiple coatings of sunscreen. I had slept in all that! That night, it felt wonderful to sleep clean. Showering required me to use about 2 gallons of water. I used a large silver bowl and a large bucket to capture the water. I started by standing over the bowl and wetting my body with my jug of water, capturing it in the silver bowl beneath me. After wetting my body, I lathered myself in soap. I used the water already in the silver bowl to rinse off as much of my body as possible. When it got too soapy and dirty, I would dump the water from the silver bowl to the bucket. Once my body was rinsed, I put more water into the silver bowl and dunked my hair in it, getting it as wet as I could. I then shampooed my hair. After shampooing, I dunked my head again in the water. I added more water to the silver bowl and repeated until my hair was free from soap. I used the last little bit of water I had to rinse my body and hair again once more over before I finished. I stand above the bucket that collects gray water at all times throughout my bath. Initially, I pour 3-4 splashes of water into the metal cleansing bowl with a few drops of soap. I soak the wash-cloth. Then, I raise each limb (one by one) directly above the bucket and wring the wet, soaking wash cloth onto my skin to dampen my body while the bucket catches the water as it falls. Once I am soaked, I scrub myself with the soapy wash cloth. Then, I rinse by repeating the same process I used to dampen myself, pouring more water into the metal cleansing bowl as needed. To properly rinse, I pour the water directly from the bowl onto my body. Lastly, I pour the rest of the water onto my neck and my face. My hair requires a lot of maintenance with various oils, so I wash it infrequently. When I do wash it, I dip my hair and crown into the metal cleansing bowl, scrubbing with shampoo (hardly) and conditioner (more frequently), and I rinse by pouring water directly on my hair until it is rinsed. I am usually able to complete my bath with half a gallon of water. A regular shower head uses 7 to 10 gallons a minute, while a water-saving shower head puts out 2 to 4 gallons a minute. An average shower lasts 12 to 15 minutes, resulting in a use of up to 150 gallons per shower. Reminds me of crossing the Sahara in 1973. We’d get a dish pan of water, under 2 gallons. Could combine with partners or not. :). Washed from the head down. Had accident, one of land rovers rolled, so were in desert longer than expected. Made a shower out of a pail with holes in it. Finally came to a town where the community allowed us to use the baths. The hot water was pure luxury. Thank you, brave ones, for doing this experiment. It is the future. I like reading about the subtle differences and especially how you are having to think through the process instead of just mindlessly turning on the faucet and leaving it run. Wow, real eye opener!! Glad you are adapting to the extreme water scarcity. Thank you for sacrificing your comfort and demonstrating to the world that the need is urgent!! So proud of you!! !